Chicken stock is easy to make. Homemade soup can be chock full o’good things. It is a vehicle for vegetables. Soup takes the edge off my hunger and when I eat a bowl around 4:00 I don’t eat as much for dinner. This recipe isn’t even a real recipe. It is as easy as it gets. Marla mentioned it in a past post and I only got to trying it Monday at 11:55 a.m., when I was starving and discovered we’d pretty much run out of food. The whole thing took less than ten minutes. I’m rewriting it here for easy reference. I dressed mine up with a dollop of sour cream, shredded cheese, and green onions. It would have also been very good with a squirt of lime, and some chopped cilantro and avocado, and maybe some grilled corn. Who knew healthy eating could taste so good? Share the post "Marla’s black bean soup: almost as easy as opening a can and dumping it into a pot"
14 Responses to "Marla’s black bean soup: almost as easy as opening a can and dumping it into a pot"
It’s only 7:45 am and yet this has made me ridiculously hungry for soup. I’m going to add the ingredients to our grocery list later and give it a try. Oh, yum! I think I’ll try this because it sounds easy enough. (And I’m terrible in the kitchen!) I wonder if you could use lentil beans instead, would it taste as good? Yummm, I am totally going to make this. My husband will think I am a genius. Do I have to tell him Marla is the genius? Just so happens I have all that stuff in my pantry or fridge. You know what else is easy? Make a vegetable soup (old veggies from the bottom of your fridge you can’t eat raw but are still good enough), an onion, and water, stick the whole thing in the crockpot, and turn it on high for 5 or 6 hours (or low for longer, or overnight). Pour the soup into several mason jars and put in the fridge (or freezer). Next day, take a mason jar, pour it into a pot, and add, say, leftovers from last night dinner. Like, I had corn and some chicken. Hearty lunch. Or cook some pasta or rice and throw that in. Some canned beans. Cheese tortellini. Whatever you have on hand. It’s so easy and, like you said, it’s chock full of veggies (you can even use the broth by the spoonfuls over some gnocchi or something just to add some vitamins to your food). I’m so making this. I have a great recipe for grilled red pepper and garlic soup. I’ll have to take photos as I go next time and post it. Yummers. Marla: soup is sustenance! The best there is! BTW I made this again but with hot salsa (and a little more of it), a healthy squirt of lime juice, and some chopped cilantro. It totally hit the spot. Delish! Mmmm, I love soup. 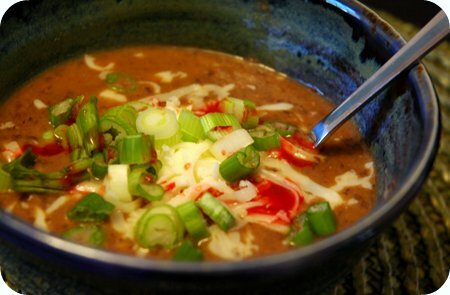 Might have to give this one a try, it is a bit different than the black bean soup I usually make. We made this today. It was great! A few celery hearts and chipotle peppers were added as well. We’ll do this one again.